Looking for a storage facility that offers you convenient access to your storage unit? U-Store 24 is the perfect place for you! We offer climate control, high-tech security, and unlimited access. Contact us today! Reserve your storage units online. 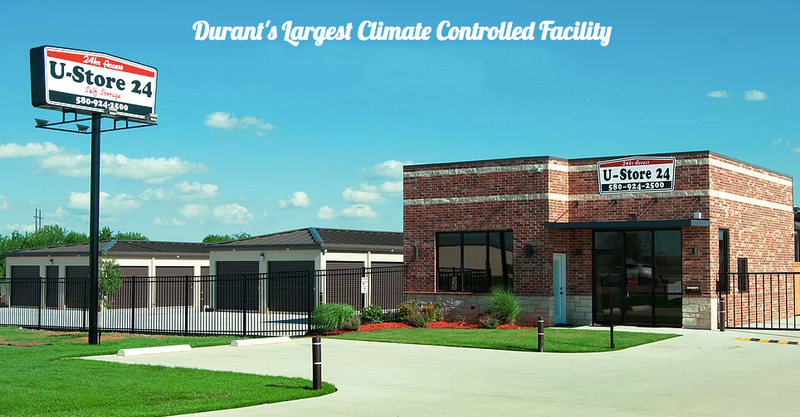 Located right off US-70, U-Store 24 is perfectly situated to meet the storage needs of Durant, Armstrong, Mead, Bryan, and Calera, OK. You'll find our facility at 9242 US-70 West next to Bubba’s Brewhouse and Jones Powersports. We're eager to help you find a storage solution that works for you. Contact us today and we'll help you get started! Our storage facility offers climate controlled units, allowing you to avoid a broad range of damages that can be caused by unstable temperatures and weather conditions. Although you’re permitted to access our facility, we do whatever we can to maintain security through our security camera monitoring and computerized gate access.